Situated at 75 degrees north and less than 1,000 miles (1,609 kms) from the North Pole, the Mars Arctic 365 (MA365) mission facility is perched on the rim of a 14 mile (22 kms) wide impact crater in the midst of a polar desert considered one of the most Mars-like environments on Earth. An ambitious simulated Mars mission that will take place over a full year in the Canadian Arctic has whittled its pool of potential crewmembers by two-thirds. The nonprofit Mars Society has selected 62 semifinalists from a total of more than 200 applicants for its Mars Arctic 365 mission (MA365), which aims to help prepare humanity for a real manned Red Planet mission down the road. "By conducting this full-scale dress rehearsal of a human expedition to Mars in a realistic habitat and environment for practically the same duration as an actual mission to the Red Planet, we will take a great step forward in learning how humans can work together to effectively explore the new frontier of Mars," Mars Society officials wrote in an update Wednesday (Feb. 26). These teams will travel to the Mars Society's Flashline Mars Arctic Research Station (FMARS) on Canada's Devon Island this summer, where they will undergo two weeks of field testing that will culminate in the selection of the highest-performing crew. These six crewmembers will then return to FMARS in the summer of 2015 to begin the MA365 mission, officials said. 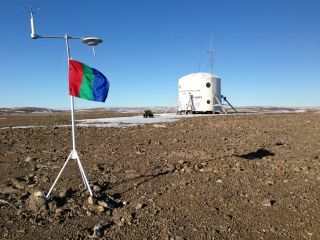 FMARS consists of a research station and simulated landed spacecraft built at 75 degrees north latitude, less than 1,000 miles (1,609 kilometer) from the North Pole. The facility "is perched on the rim of a 14-mile-wide impact crater in the midst of a polar desert considered one of the most Mars-like environments on Earth," Mars Society officials wrote in Wednesday's update. "MA365 will see a crew of six scientists, researchers and explorers conduct a Mars surface mission simulation for 12 months, including over the harsh, sub-zero Arctic winter." FMARS isn't the only facility the Mars Society uses to help prepare for manned Red Planet exploration. For example, the organization also runs simulated missions out of the Mars Desert Research Station near Hanksville, Utah.